Write on Wines: Trader Joe’s Wines: Bargains or Bust? Trader Joe’s Wines: Bargains or Bust? For five years running, the topic that always seems to come up at our Cooking with Class wine dinners is the wine selection at Trader Joe’s. Guests enjoy dishing about their favorite picks, passionately engaging in rounds of “Have you tried…” and ‘Yes, but have you tried…” Other times, our guests want to know what we wine professionals think about TJ wines or our opinion of their go-to TJ picks. 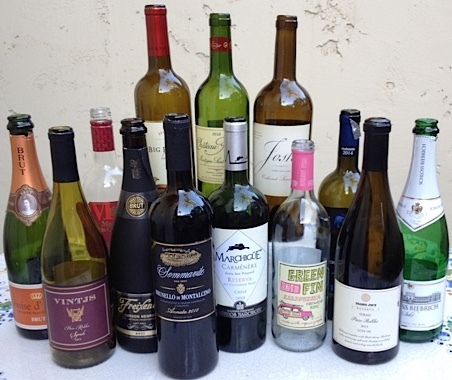 Which of these Trader Joe's wines made our cut? This Saturday, starting promptly at 5:30 p.m., we’re taking on TJ wines at a special Trader Joe’s wine dinner and class. The tasty three-course spring dinner – followed by dessert, of course – will be accompanied by five wines from TJ’s current selection. The Chef Janet Ebright-designed menu features a few TJ specialties you might want to put into heavy rotation at home. Chef Janet will also demonstrate different ways home cooks can get creative with TJ products, including items you may not know or not know how to use in your cooking. Plus, you’ll learn a few different ways to navigate Trader Joe’s every-changing wine aisles and how to spot the store’s value bottlings, beyond price alone. You’ll also taste a few gems we’ve found, from weekday quaffers to wines that will be the talk of your next dinner party. Call Jane Angwin to reserve at 760.777.1161 or make your reservation online. Bring your TJ passion and a big appetite for food and fun.